One of the mainstays of futurism stories has always been the image of a viewscreen on a wall that people make video calls with; it always ranked somewhere up there in the pantheon of concepts we would always see of flying cars and jetpacks. Well, we may still be waiting on the flying cars, but the age of the video calls on your wall seems to have finally arrived. Skype announced this week that it will be demoing television sets from LG Electronics and Panasonic at the Consumer Electronics Show (CES) in Las Vegas that have Skype software built into them. 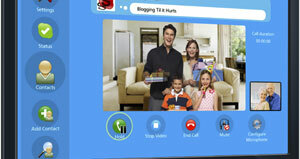 The new television sets will allow you to place video calls directly from the TV via a 720P HD web cam (sold separately) to anyone else using Skype software whether it be on a computer or TV. You will also be able to pull up your contacts to see who is online, make standard phone calls with the built-in microphones of your camera, free Skype-to-Skype calls and even choose to answer incoming calls to your Skype In number if you so choose. So, why is this significant? Besides the overwhelming cool factor of finally placing calls on a huge video screen in your living room (and the endless jokes that will inevitably be made about Big Brother from Orwell’s 1984), there is a distinct possibility of this being a significant tool to bringing friends and family together. While video conferencing from the desktop has been around for some time now, it is not always the most pleasant place to do it from: An uncomfortable chair, wearing a headset sometimes, it just really isn’t that attractive. Now you’ll be able to do it from a place where you can be more comfortable, and with it being a device of this size and ease, it may also lead to you doing it more often. Come on, you know you want to see your sister’s baby 24/7 on a Skype video call. This also has the potential of being a boon for small businesses. Full video conferencing set ups have long been out of reach financially for most small business owners, but depending on the price of these TV sets, you could theoretically set one up in your office for meetings and larger conference calls for around a thousand dollars or so. Still not convinced of why this is so cool? What about the potential implications in a classroom setting? Distance learning could now be done on the relative cheap for entire classrooms in schools, through distance learning courses, homebound students with disabilities and even for people taking online courses through a university. Not only has Skype freed the family and businesses, but it has freed itself. While Skype has been available on some mobiles for a while now, and even had dedicated cordless phones that made the service feel a bit more like a normal phone service, this will put the service literally in the middle of your living room. It will come to feel like a necessary aspect of your life that allows you to communicate the way you want, when you want and how you want. We realize that this technology has existed for years, but this is a freeing of that technology now to the masses. This is something the average family or small business can afford without going through complicated technical setups or having to mortgage their home to afford the equipment. While Skype is estimating that over five million Skype enabled TV sets will make their ways into homes this year, that may be a bit over optimistic in our opinion, it seems Skype is on track to getting its mojo back.